"No Equal In The World®" and "The Ultimate In Protection & Performance®" are more than just trademarked slogans. Prolong’s Anti-Friction Metal Treatment (AFMT™) advanced technology is unique worldwide. When a nail is submerged in a glass of water, see how Prolong AFMT™ immediately bonds to the metal surface. Prolong’s AFMT™ technology doesn’t just enhance motor oils, transmission fluids, gear oils, and other lubricants. The AFMT™ formula actually treats and modifies the surface of the metal. AFMT™ is a highly specialized extreme-pressure property lubricant that is formulated by chemically treating paraffin-based hydrocarbons, known to be superior lubricants capable of withstanding extremely high temperatures and pressures. Prolong AFMT™ is formulated with a unique long-chain molecule achieving significant chemical stability. This process is so stable that it is responsible for achieving the highest possible “1a” rating in independent laboratory testing designed to determine the anti-corrosive characteristics of lubricants. Motor oils, transmission fluids and gear oils are flowing lubricants that provide a film barrier between metal surfaces pressing or rubbing together. The greater the film strength, the better the oil. However, in extreme pressure metal-to-metal areas, the film strength of oil is seriously thinned and is often completely squeezed out. On the other hand, Prolong is a bonding lubricant. Prolong AFMT™ interacts with metal surfaces in a molecular and chemical process to create a protective buffer on the surface of the metal. This is not a film or coating over the metal. Molecules in the AFMT™ formula are polarized and actually bond with the metal surface. The layer of AFMT™ molecules is activated by extreme pressure and heat, meaning that Prolong lubrication performs best right where it is needed most! The result, AFMT™ significantly reduces harmful friction and heat. Metal surfaces feel smooth, but under a microscope, they have tiny valleys and peaks on the surface. The “peaks” can catch or snag as metal surfaces push and slide against one another, causing particles of metal to break away, leaving the metal surface to become damaged and vulnerable. When these metal particles or shavings are found in drained oil, it is a sign of metal fatigue and damage. The metal particles can also cause additional harm as they circulate through the oil, rubbing against metal parts and impairing the efficiency of filters. The protective layer formed by Prolong molecules lubricates the raised metal surfaces and through an extreme lubricating film pressure fills in the “valleys” by smoothing out the peaks, diminishing the effects of metal-to-metal friction. As this sacrificial protective layer of AFMT™ is worn away, it is constantly replaced by new AFMT™ molecules circulating within the oil. When the energy from fuel combustion is not being used to overcome friction it goes straight to the horsepower needed for optimum performance and fuel economy. Prolong AFMT™ makes the metal more slippery and reduces the friction that causes metal fatigue and steals horsepower. This process also helps eliminate the harmful heat produced by friction. High oil temperatures accelerate oxidation and the formation of acids, peroxide, carbon residue, sludge and varnish formations. 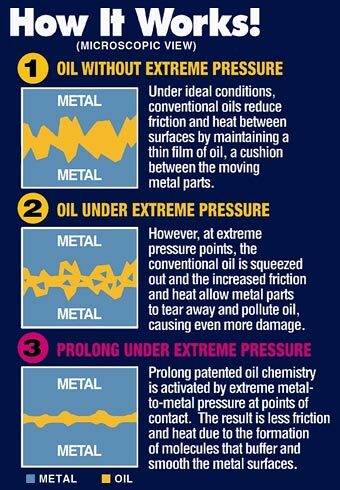 As oil temperature rises, oxidation takes place, the oil becomes increasingly corrosive, and oil viscosity decreases resulting in a loss of lubrication. Prolong AFMT™ helps reduce heat so that the oil can maintain maximum protection performance. Additionally, premium dispersants are added to Prolong lubricants to help remove carbon build-up and sludge residue. These contaminates are then suspended in the oil and eliminated at the next oil change. Removing these contaminants maximizes performance and horsepower. To demonstrate the anti-friction capability of the Prolong AFMT™ formula, these bearings were subjected to a standard lubricity test in a bench cross-axis friction-testing machine. These stationary hardened steel bearings were pressed against a spinning lubricated metal race. The deeply scarred bearing on the right shows the typical wear without AFMT™ protection. The bearing on the left shows typical wear when Prolong Engine Treatment is added to the motor oil. Prolong AFMT™ technology has gone through a variety of independent laboratory tests to prove its superior extreme pressure lubrication capabilities. Here are just some of the test results from strict, industry-accepted automotive lubrication testing procedures. It is important to know that Prolong products DO NOT contain the harmful chemical, metal or plastic elements found in the technologies of competitive products. PTFE’s or Teflon (A registered trademark of DuPont) is a great product for cookware, provided the right utensils are used. But metal-to-metal contact can cause flakes that aren’t safe in food… or engines. Be careful with products based on this technology. Clogging of essential filters and lubrication flow can become a serious problem. PTFE resins can leave harmful deposits and residue. Solid particles also break down with heat rather than helping reduce temperatures. Copper, zinc, graphite and “molys” (molybdenum) technologies do not provide extreme pressure friction protection. They break down rather than provide protection from harmful heat and can introduce harmful solid particles into the lubrication system of the engine. Unstable chlorinated-paraffin (“CP”) presents the potential for corrosion when heated. CP lubrication is very effective, but in the heated conditions of an engine, the short-chain molecular properties can break down, forming hydrochloric acid. Prolong has a stable technology not found in any other product that is extremely efficient and safe. This technology has been time tested (over 18 years) and in millions of engines. Solvents are sometimes advertised as lubricants. They generally contain mineral oils, which decrease the viscosity of the flowing lubricant. Solvents may be cleaners, and a cleaner engine offers some improvement in performance, but solvents or cleaners do not provide lubrication protection and can thin the motor or gear oil. More importantly solvents breakdown lubricity and viscosity. Most thickeners, sometimes called stabilizers, replacing a quart or more of oil do not contain the essential additive packages in today’s premium motor oils and are actually robbing the engine of 20-25% of those cleaning and antioxidant benefits. Remember that today’s natural and synthetic motor oils and transmission fluids are better than ever, but they do have their limitations. Prolong encourages users to follow manufacturer’s recommendations regarding oil weights and service schedules. Prolong products do not alter the viscosity of the motor oil or transmission fluid, but form a lubrication “partnership” by providing bonding lubrication to surfaces subject to extreme pressure friction, or where flowing lubrication may not even be present. Prolong technology helps turn ordinary natural or synthetic oils into a “Super Lubricant”.